A new Warlock minion from Hearthstone's upcoming expansion, The Boomsday Project, has been revealed. 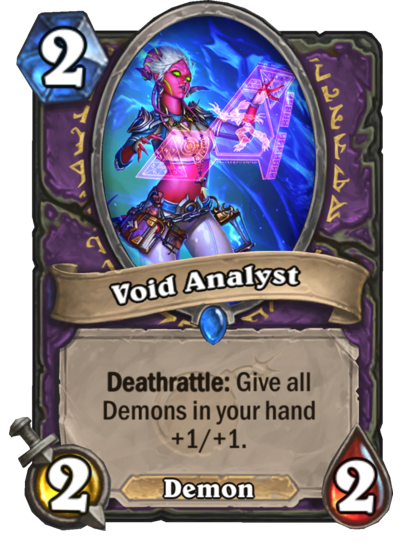 Void Analyst is a two-mana Demon with two attack and two health. It also has a Deathrattle ability that gives all of the Demons in your hand +1/+1. At first glance, this card just seems too slow to be really good. It would probably only see limited play in Zoo Warlock decks—but even then, it might not have a spot because other options are just better. Prince Keleseth, for example, is a two-mana neutral minion with a Battlecry effect that gives all of the minions in your deck +1/+1 if you have no two-cost cards in your deck. Void Analyst isn't the only Warlock card that was revealed today, though. The Soularium is a legendary one-mana Warlock spell that lets you draw three cards—but at the end of your turn, you have to discard them if they weren't used. The Boomsday Project is the second Hearthstone expansion of the current Standard year, the Year of the Raven. It'll introduce 135 cards to the game, including new keywords like Magnetic. The set can now be preordered and all of the cards will become available on Aug. 7.